Thank you for your interest in becoming a Sailor with the Sirens of New Orleans! Sailors are the amazing men and women who march with the Sirens, offering support on the route to the dancing Mermaids, crowd control, carrying our banners and props, passing out our signature throws (the coveted “Message in a Bottle”), helping with production, and interacting with the crowd. Networking. 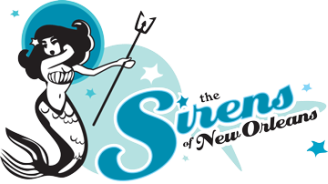 Sirens is a spectacular group of multi-talented men and women from different backgrounds and experiences, and joining our organization as a Mermaid or a Sailor is a wonderful way to meet new people. Socialize. Come have fun with us! Decorate throws at Bottle Parties, socialize at a Sirens happy hour, have a playdate with Sirens and their little merpeople, or take advantage of other social opportunities! Service. We provide various opportunities to give back to our community. Come find a new philanthropy to love, or bring a favorite charity up to the philanthropy committee to have it considered to receive Sirens support. Experience Mardi Gras in a whole new way. There’s nothing like marching down St. Charles Avenue in a Mardi Gras parade!